Andrew & Kelsey’s 840-Petaled Paperversary! — Paper Rose Co. But then I looked at the details and remembered chatting with Andy about how I make hydrangea and why they're a little pricier than my usual blooms. Oh yeah—hydrangea. Five of them. This one wasn't going to be as quick as I thought! I made my first prototype of hydrangea around this time last year after an inquiry. I knew they were possible, I just didn't know the logistics or exactly how much time I'd need. Many stems later, I have my system down. 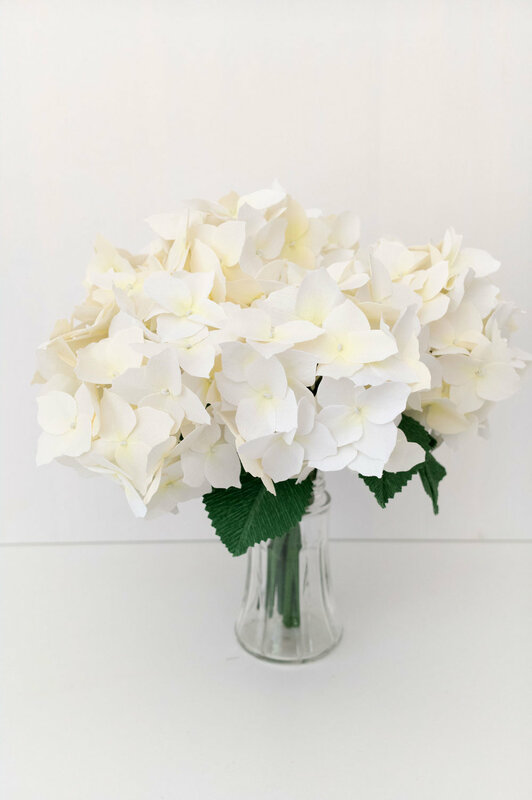 I compose each of my stems of 42 blooms clustered in groups of 3 and wired into a sphere—if you do the math, that's 168 petals per hydrangea. And no matter how well I've prepped, there's only so many ways to speed these up! Recently I also started adding little touches of color at the centers of each bloom—this really helps with the all-white versions which usually seem to act more as a filler or as greenery in arrangements. But I felt it was especially important in this recreation to add just a bit of depth and freshness to the piece. Unlike Kelsey's original bouquet, I kept the petals uniform in size. I wanted to make the arrangement as full as possible and make the most of each and every one of the 840 petals it contained! And I was thrilled to get an email from Andy the night of their anniversary. "She absolutely loved it." Mission accomplished!